New mummies everywhere are pulling out their calendars and planning a playdate with the baby down the block. This classic cardigan is just right for putting your best foot forward with a new friend! We set out to create the perfect piece for any wardrobe, baby or big, and the thought of matching baby and daddy cardigans didn’t hurt either. Playdate is sized for mamas & papas too! Why does every baby need this cardi? Layering is perfect for babies, and with a casual drop shoulder design in sock weight yarn, this sweater fits the bill. Knit up in a lovely wool it is light but warm, a baby wardrobe must! Playdate is the first instalment from Max & Bodhi’s Wardrobe: A Tin Can Knits Club. The collection has 6 designs, and 3 size up to adult! They are modern, seamless, unisex and fun-to-knit… just what you expect from Tin Can Knits. To get the pattern you can pre-order the ebook or the print + ebook here. You will get the Playdate cardigan pattern right away, and a new pattern will be sent to you every 2 weeks. Pattern Launch Dates: April 02, April 16, April 30, May 14, May 28, and June 11 2015. Not keen on the surprise? Just wait and see as the designs are released. All the patterns will be available individually once the final pattern has been released. Our samples are knit up in Sweet Fiber Cashmerino 20 in ‘Canary’, ‘Sea Glass’ and ‘Spanish Coin’. Sweet Fiber Cashmerino 20, luxuriously soft and baby-tested! For Playdate we had the pleasure of using Sweet Fiber Cashmerino 20, and the results are luxurious! This yarn is buttery soft with the amazing depth of colour that Sweet Fiber is known for. A treat for a tiny new person, or for yourself. Melissa is currently selling her Cashmerino 20 in all of her gorgeous colorways here, hurry! Interested in knitting along with Max & Bodhi’s wardrobe? Join our KAL group on Ravelry. Each completed project gets you an entry into a draw for some fab prizes! As we launch the upcoming patterns from the collection, we’ll also be sharing new tips, techniques, and some funny baby stories too. The best way to stay in touch is to get our emails, but we also love to share on Facebook, Instagram, Twitter, Pinterest and Ravelry! 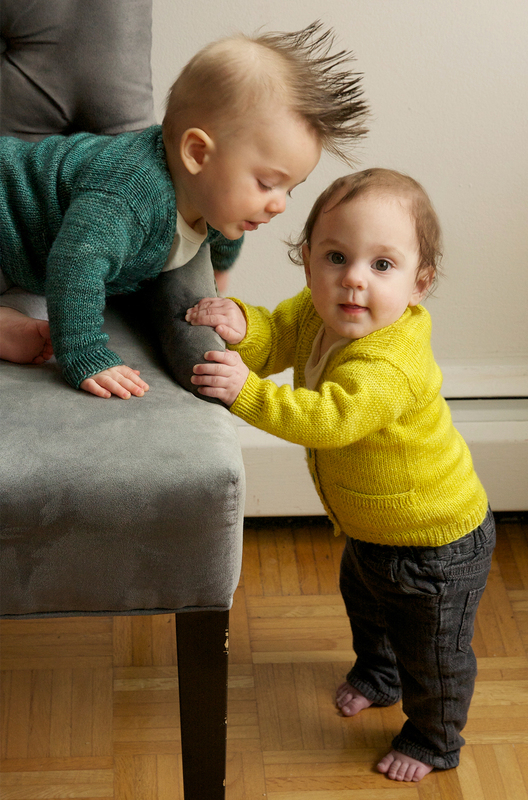 ← Max and Bodhi’s Wardrobe – 6 knits all about the babes! So cute! Can’t wait to knit for my littles! dear girls, your patterns are my favorites! i have made “gramps” for my grandson and granddaughter, love it! i love them all! one thing tho, if I may, my dears most of us cant afford these high prices yarns, beautiful tho they are!, but seriously, 34 dollars for a skein of yarn! for a sweater! in a sock yarn no less! that takes forever to knit up! I’ve got to work outside the house and I’m tired when I get home. I’d like to see the result of my knitting quickly! just a suggestion, if I may, could you lean towards more moderately priced worsted weight yarns. I know I cant afford 34$ for a skein of yarn and for most of us middle class, thats just to much money for a baby sweater . I am well aware of the time and effort that goes into hand dying yarn, I’ve done it myself, I’m just saying for the majority of us, thats way too expensive! I love your website I love your patterns, please keep em coming! You girls are doing an awesome job! well done! bravo! Hi JoAnn – Thanks! Well, we thought this sweater would be a special little number but of course there are TONS of sock yarns out there, at different price points. Sweet Fiber has her Super Sweet sock that isn’t as expensive as the Cashmerino 20. We do have lots of worsted weight sweaters that knit up quite nicely in lots of different worsted weight yarns. Substitutions are always knitters choice! That’s why we list the weight of yarn and the yardage required, to make subbing yarns easy! oh my gosh, so freaking adorable!! look at those sweetie pies, rocking their fab cardis!